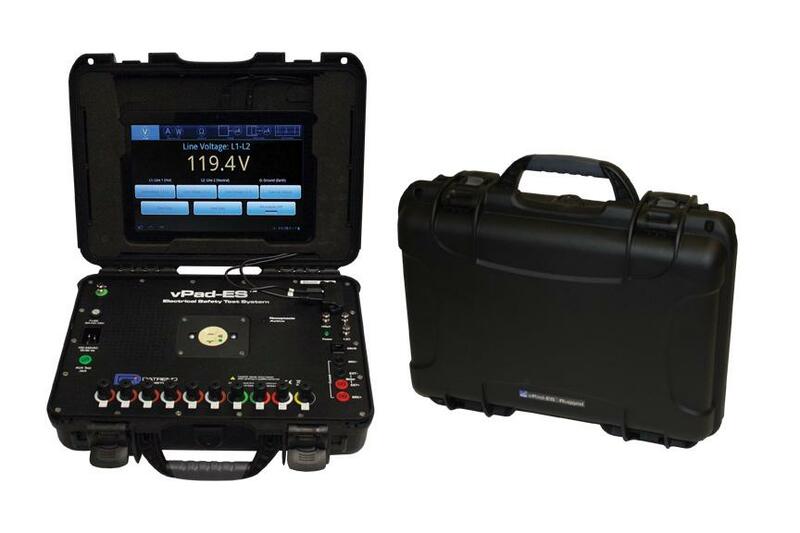 Built on the Vision Pad Platform, the vPad-ES Rugged is the ideal Electrical Safety Analyzer for Field Service Engineers. Housed in an Extreme Duty case, the vPad-ES Rugged offers the functionality and scalability that you have come to expect from Vision Pad Technology products plus the added assurance of knowing your system will be protected in the harshest of environments. 47 to 63 Hz, 20 A max. 47 to 63 Hz, 16 A max. Base unit: 14.3 x 11.1 x 4.7 in. Tablet PC (detachable): 10.5 x 6.7 x 0.5 in. vPad-ES and vPad-353: Begin your Vision Pad experience with a new standard in ‘basic’ manual testing.vPad-ES and vPad-353 provides basic electrical safety in a new, rich graphical environment using an Android tablet. Testing can be done following the requirements of the IEC60601, AAMI-ES1 or IEC62353 standards. As individual tests are made, a test record is created in internal memory. The results of the test can be viewed at any time , or saved to a test report file for printing or distribution. A 25 point, fixed format physical inspection procedure is standard in the basic apps, and forms part of the final test report. Basic electrical safety testing has never been so easy. Record Manager: View/Print/Convert and Copy Test Reports.Record Manager provides direct access to all test reports created by the vPad Apps. Reports can be reviewed on screen. In addition, reports can be converted to PDF documents; printed to a wireless printer; or copied to USB or a Bluetooth device (PC) one at a time, or in user selected groups. File management has never been so easy or complete on a basic manual safety tester. Datrend Docs: Save, store and find technical documents.The vPad Datrend Docs is a technical document library, ideal for storing electronic manuals, procedures and specifications. Datrend Docs is included with all vPad products.